1. Knead a soft dough for the parathas using water as needed. Cover the dough and leave it aside for 15 minutes. 2. For the stuffing, add all the ingredients in a bowl and mix well using your fingers. 3. Once the dough has rested, make 6 equal sized balls out of it. 4. Roll a dough ball into 4" inch diameter. Use dry flour as needed. Add about 2-3 heaped spoonful of the paneer filling. Bring the edges of the rolled dough in the center and seal it. 5. Roll it again into 6 to 7-inch diameter and cook it on both sides till light golden on a hot tawa using oil/ghee. 6. Repeat it with the rest of the dough balls. 7. Serve warm with curd, ketchup or green chutney. Enjoy! This is my entry for BM#89 Day 3 under the theme 'Stuffed Dishes'. For Day 1, I had posted Stuffed Cauliflower Paratha and for Day 2 I had posted Rajasthani Mirchi Vada. My kids favorite stuffed paratha,you shaped it to a perfect round and drooling after having my lunch..
Lipsmacking here.. 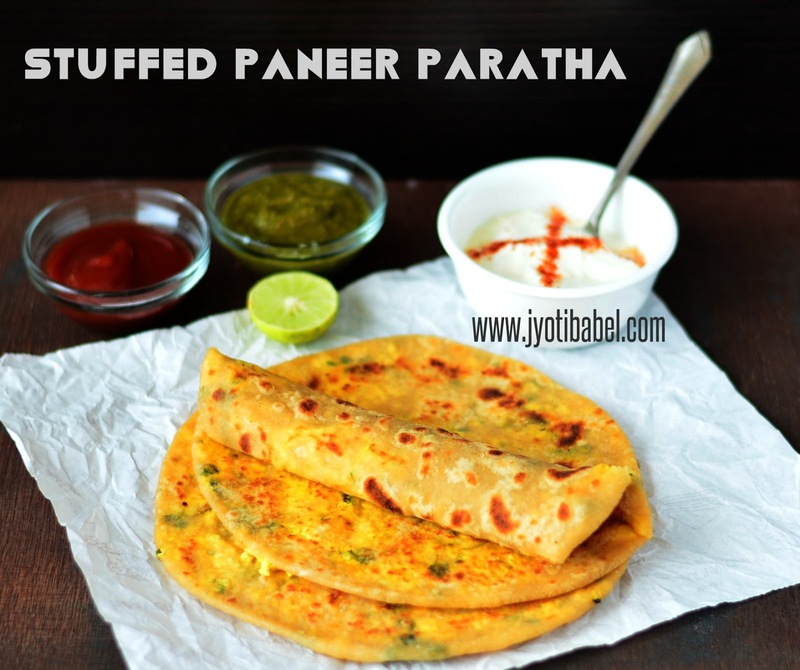 Such a fabulous looking paneer paratha, those stuffing tempts me a lot. ALluring parathas there. Paneer parathas are very popular and a favorite in my house. Fresh made paneer really enhances the flavor. Nice one. One of the much loved parathas , and this Paratha looks very well made with good stuffing , perfectly roasted and perfect round too . Loved all the stuffed dishes you have showcased. These paneer parathas our our family fav. I can have paneer daily so I would be really happy to have these parathas. They look gorgeous and the whole spread looks super inviting.. I think Paneer parathas are everybody's favorite!..your parathas are looking so inviting and very nicely done. Enjoyed your stuffed dishes! Absolutely delicious paratha and you have made them perfect. I am absolutely drooling looking at your pictures. I live paneer paratha and wish I can eat yours from the screen. Great clicks and beautiful recipe. Perfectly made Paneer Parathas Jyoti. Drooling over your pics! Such a yummilicious protein packed Paneer Paratha!! Simply Loved this!! Im craving for some paneer paratha now.. So good and lovely.. The parathas have turned out so well and you have presented it so well Jyoti. This is one of the most popular ones and my kids fav too. Paneer paratha is my favourite and yours looks so tempting!